Waist fit morphs included. 20 different textures included. As always great product. Wishing you and yours a great Christmas. Thanks muchly Wendy. Season's Greetings to you. Wonderful work. Thank you very much. 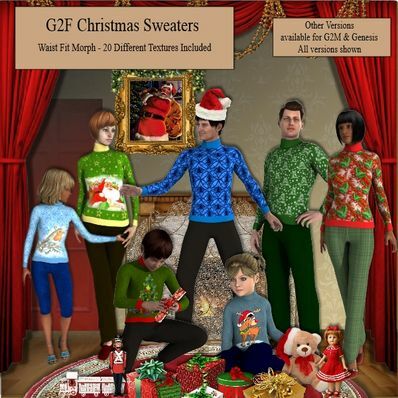 These Christmas sweaters are awesome! Just love them, they are so darling!! The waist morph is so handy, thanks again. Thank you so much - This will help me in creating a little holiday gift image to send to people. I'm really running late this year! Thank you so much for the three sweater fits! Perfect for a scene I have planned, you do wonderful work! Thank you very much and have a happy new year. Nice one. Thx for all your work Merry Christmas! Great sweater. Thanks a bunch and Happy Holidays! Many thanks for your generosity and Seasons Greetings. Wonderful work as always! Merry Christmas! Thank you very much :) Merry Christmas!